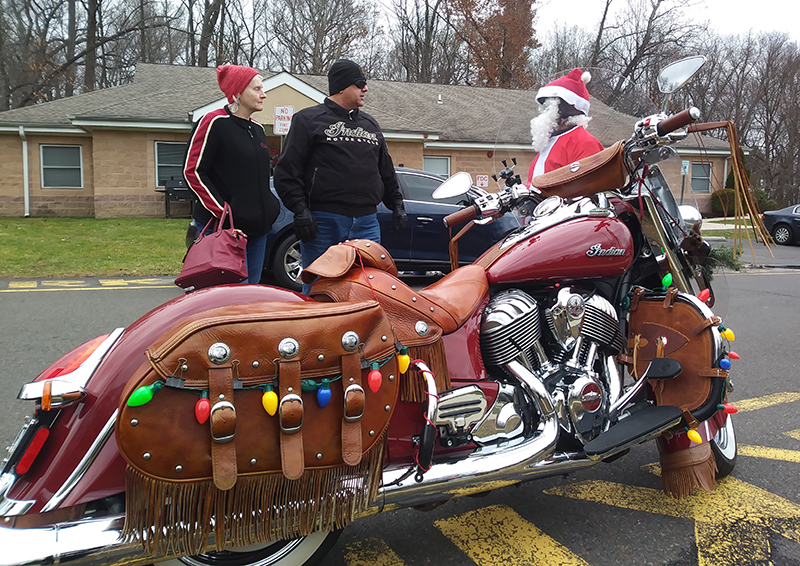 Santa saddled up an Indian motorcycle to deliver Christmas presents for at-risk youth at an archdiocesan center in Bensalem. 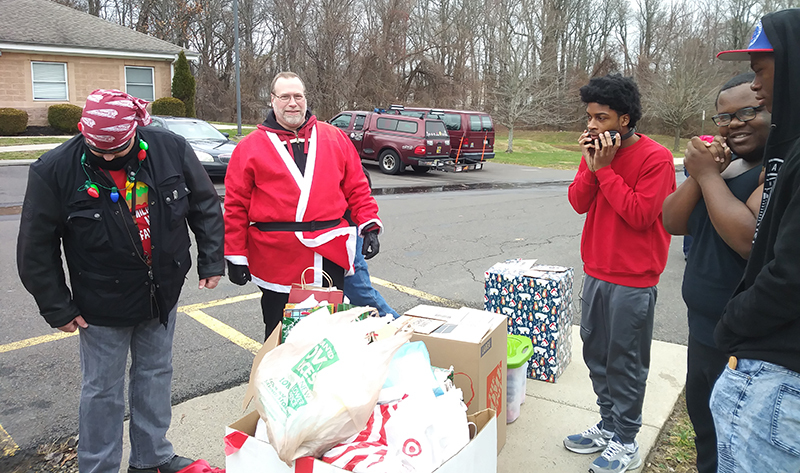 On Dec. 22, a dozen members of the Delaware Valley Indian Motorcycles Riders Group (IMRG) braved damp roads and chilly temperatures to bring boxes of gifts to the residents of the St. Francis-St. Joseph and St. Vincent Homes. The homes offer residential and educational programs, as well as case management and outpatient clinical services, for more than 100 dependent and delinquent teens. In addition to six group homes for boys and two for girls, the center includes a maternity and mother-baby home, a supervised independent living program and Romero House, a residence for unaccompanied refugee minors. Certified by the internationally recognized Council on Accreditation for human service agencies, the homes provide trauma-informed care, a treatment approach that emphasizes compassion, nonviolence and emotional intelligence at all levels of human interaction. For the homes’ residents, the sight – and sound – of the bikers signaled a day they “didn’t have to worry about being without a family, without a home,” said Deacon Anthony Willoughby, the center’s spiritual director. “They can relax and just be kids,” Willoughby said. Sponsored by Cosmo’s Indian Motorcycles in Trevose, the toy run is now in its second year. For the bikers, the outreach is a chance to unite the riders’ group, dealership staff and customers, and loved ones for a great cause – and a good roar. “We had a donation bin at Cosmo’s, and all of the group members put feelers out,” said Steve Willans, vice president of the Delaware Valley IMRG. Now in his senior year, Price – who also works for two local department stores – will soon join a large number of recent alumni. According to Willoughby, 12 youth recently graduated from the program; 11 of them went on to post-secondary education, two with full scholarships. Like Price, Mason Rainey was touched by the bikers’ generosity, which put a remote control helicopter in his Christmas stocking.